Vibrant eco glass jewelry holders adorned with bullhorns, swirls and other novelty shapes, including a guitar shaped ring dish and the symbolic heart in hand design. Paloma offers a wide array of home decorations, eco jewelry and accessories to enhance your lifestyle. For joy, for ease, for convenience, and for beauty. We transform your home or office space with the color and radiance of mother nature as we transform old glass into stunning works of art. These sweet usa made jewelry holders are without a doubt, one of the most popular gift item we make. Vibrant glass dishes adorned with bullhorns, umbrellas and other novelty shapes including the popular guitar shape ring dish and the symbolic heart in hand design. The fused glass sparkle and the depth of character in each piece evokes an awe and satisfaction in all who behold. It is a delight to the senses just exploring the possibilities. 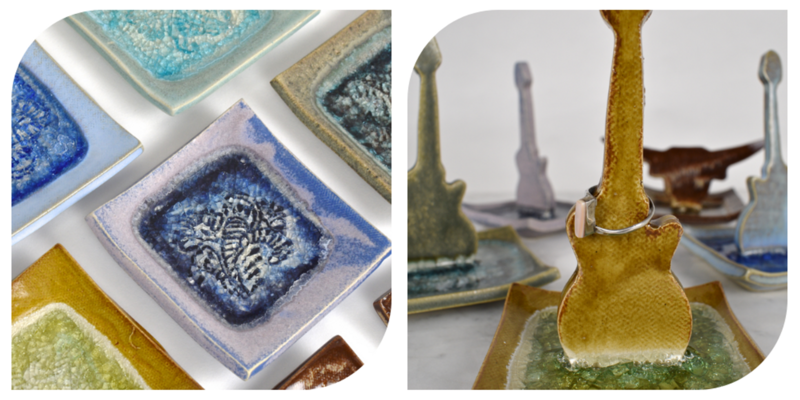 With quantity discounts plentiful and free shipping on all first time orders, you can make one enjoyable visit to Paloma Pottery and be done! Gift wrapped in shreds of recycled wood cellulose, non-bleached tissue, and held inside a clear Paloma box with a red raffia bow. Simple earth friendly elegance.